THE LOWEST LEVEL YET – The latest episode in the Donald Trump White House of Shame has to be the lowest level yet for “the Orange One’ – effectively calling the widow of a Green Beret soldier a liar because she and her congresswoman, and her mother told the truth about the so-called “condolence” call Trump made to her about the death of her husband – Sgt. La Donald Johnson of Florida. By now you know the story – Congresswoman Frederica Wilson was invited to listen by Sgt. Johnson’s widow as Trump called, supposedly to offer condolences on the death of her husband after an ambush in Niger. Trump apparently never used Sgt. 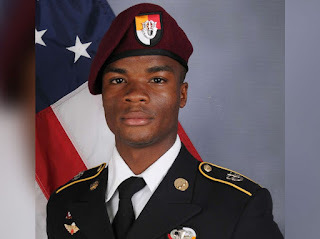 Johnson’s name in his remarks, and also told the grieving widow that her late husband “…knew what he was signing up for….,” meaning that the man was a soldier, and soldiers fight to die for their country, so no big surprise here. Sorry it had to be your husband this time, but those are the breaks. Needless to say, the widow was even more distraught after her husband’s coldhearted commander-in-chief seemingly write him off as just another war casualty. And Congresswoman Wilson, who knew Sgt. Johnson very well since he was a teenager, wasn’t having any of it. Apparently with permission from the widow and the rest of the family, Wilson blasted the president for his insensitive remarks and tone. So what does the Trump White House do? Instead of using common sense, and some decency, for goodness sakes, they decide to strike back, first calling Congresswoman Wilson “wacky” because she loves to wear cowboy hats, and then further blasting her for daring to openly challenge Trump. That’s when White House Chief of Staff Jo at a 2015hn Kelly, a retired four-star general in the US Marines, who lost his son to combat in 2010, chimed in, personally attacking Rep. Wilson for allegedly self-serving remarks she made at the 2015 opening of a new FBI building in Florida. Except that a video of the event Kelly referenced showed no such thing. What the video did show was Congresswoman Wilson praising the FBI, praising law enforcement in general, and praising the memory of the two agents the building was named for. If anything, she gave plenty of credit to the Renate who helped her get the naming of the building official in just four weeks. So now the world sees that not is President Trump a liar (we knew that, but now he’s corrupted his chief of staff, a military man whose sense of duty should always mandate that he be honest, no matter what. Instead, we now know that Gen. Kelly is a liar, too. And then Monday morning, the widow interviews on ABC-TV, confirms what Congresswoman Wilson has been saying the whole time, and makes clear that her late husband, who she buried just the day before, deserved better from the president of the United States. And what does Trump do? Gets on Twitter, and essentially calls her a liar. My late mother used to always tell me that “GOD does not like ugly.” In that case, I can’t see him having any love for Donald Trump, John Kelly, Sara Huckabee Sanders, or the rest of the most shameful White House in American history. Even Richard Nixon’s thieving White House had some redeeming qualities, compared to this bunch. This is indeed, the lowest level ever. 2020 can’t come fast enough for us to vote these evil clowns out of office! In the midst of last week’s blazing controversy concerning Pres. Trump’s alleged insensitive remarks to a Gold Star widow upon her husband’s death, and the president and Chief of Staff John Kelly’s lambasting of a Florida congresswoman who criticized Trump afterwards, both North Carolina black congressional members are outraged, and say the White House owes apologies to the dead soldier’s family, the congresswoman, and the nation. “It is embarrassing that this administration is more concerned about belittling a sitting congresswoman than getting answers for the families of these fallen heroes,” US Rep. Alma Adams (D-NC-12) said in a statement Monday. Adams and her North Carolina colleague, Congressman G. K. Butterfield (D-NC-1), joined the chorus of criticism against Trump, Kelly (who is also a retired four-star Marine general who lost his son in combat in 2010), and the rest of the administration for effectively calling Congresswoman Frederica Wilson (D-Fla) a liar when she alleged that on a condolence call to Myeshia Johnson, the pregnant widow of Sgt. La Donald Johnson, who was killed during an Oct. 4th ambush in the African country of Niger with three colleagues, that Trump matter-of-factly told Mrs. Johnson by speakerphone on Oct. 17th, “ …he knew what he signed up for, but it hurts anyway…,” and didn’t even refer to her late husband by name. “That’s what hurt me the most, because if my husband is out here fighting for our country, and he risked his life for our country, why can’t you remember his name? And that’s what made me upset and cry even more, because my husband was an awesome soldier,” Mrs. Johnson told ABC News Monday. Trump, in a series of angry tweets, denied saying that, and Gen. Kelly then publicly blasted Congresswoman Wilson, calling her “an empty barrel” during a White House briefing last week. Rep. Adams wasn’t having it. Rep. Wilson has also been a leading proponent of rescuing 276 school girls from the Nigerian town of Chibok who were kidnapped by the terrorist group Boko Haram in April 2014. Congressman Butterfield was just as flabbergasted. Adding more proverbial salt to the open wound, Gen. Kelly went on at that press briefing to strongly suggest that Wilson was a lying showoff who previously boasted about raising the money needed to get a new FBI building built in Florida in 2015. A video of the event actually proved Kelly wrong (Wilson wasn’t even in Congress when that money was appropriated), but that didn’t stop Pres. Trump from still attacking Rep. Wilson as “wacky” and a liability to Democrats. All of the Congressional Black Caucus was livid with the White House, but on Monday, Congresswoman Adams led the female members of the CBC in standing up for their colleague, Rep. Wilson. “We were appalled by White House Chief of Staff John Kelly’s statements where he called Congresswoman Wilson an ‘empty barrel’ and accused her of taking credit for securing funding for a new FBI Building in Miramar, Florida…,” the CBC women’s statement said. Meanwhile, news is just starting to filter out of Niger this week as to exactly what happened in the Oct. 4th ambush that claimed the four American servicemen’s lives. Cong. Butterfield says that is what the president, and the nation, should be focused on. Just when Democratic lawmakers thought they’d seen it all when it comes to Republican voter suppression laws, illegal voting districts and, in the opinion of many, over-all power grabs, comes yet another legislative shocker. The bill reads in part, “Justices of the Supreme Court, Judges of the Court of Appeals, and regular Judges of the Superior Court shall be elected by the qualified voters (of the state) and shall hold office for terms of two years and until their successors are elected and qualified. (2) All terms of office for persons elected prior to July 1, 2018, to the office of Justice of the Supreme Court, Judge of the Court of Appeals, or regular Judge of the Superior Court shall expire December 31, 2018. (3) All Justices of the Supreme Court, Judges of the Court of Appeals, and regular Judges of the Superior Court shall be elected to a two-year term of office beginning with the general election held in 2018." With the General Assembly reconvening in January, this amendment could be on the May 2018 ballot for voter’s approval, with judicial elections held in November 2018. Then on Tuesday morning of this week, Senate Majority Leader Phil Berger (R- Rockingham) announced the formation of a new 15-member Senate Select Committee on Judicial Reform and Redistricting. Sen. Rabon is one of three Republican senators to chair the committee. Indeed, there are only five Democratic senators appointed to the panel, meaning that Republicans, just like in the rest of the legislature, are in the majority and in control, so they’ll have the final word. Most Democrats interviewed believe that by “strengthen our courts,” Sen. Berger and other GOP’ers simply mean put more Republicans on the bench, especially on the state Supreme Court. Dems’ nerves have already been rubbed raw by House Bill 717, which calls for judicial redistricting without any judicial input, and they found no relief when Republicans voted to literally cancel the 2018 judicial primaries over Gov. Cooper’s veto, leaving the possibility of adopting a judicial merit selection system when lawmakers return for their next regular session on Jan. 10th. But the target of Sen. Rabon’s Senate Bill 698 isn’t just reducing the terms of superior court judges or state Supreme Court justices – most of whom are Democrats. “The most prominent victims of this court destruction scheme will be those judges who were elected during this past election to four and eight year terms of office, and this class includes Associate Supreme Court Justice Michael Morgan, an African American,” says attorney Irving Joyner, chair of the NCNAACP Legal Redress Committee. Morgan’s 2016 election gave Democrats a 4-3 majority on the state’s High Court. Republican legislative leaders toyed with simply increasing the number of seats on the court to ultimately have more Republicans either be elected, or appointed. But now with Rabon’s bill, if it passes next session, Morgan’s term would be end December 31, 2018, giving him only two-years on the bench. Every other justice’s term would end in December 2018 as well, meaning regardless of how long they’ve served, they’d have to either run for re-lection, or leave office. Now that justices and judges are required to run in partisan races, it would make it easier for GOP judicial candidates to mount more negative campaigns against Democrats. Republican Rep. Donny Lambeth (R-Forsyth), however, sees nothing wrong with radically changing the system. If Sen. Rabon’s bill passes, it would make North Carolina the only state in the nation requiring just two-year terms for its Supreme Court justices. Needless to say, Democrats find themselves, once again, shaking their heads. “This continuing, unnecessary infringement on the structure of the judicial branch by the legislature - without demand for it and without proper vetting - smacks of the worst type of political maneuvering,” opined Rep. Amos Quick (D- Guilford). Rep. Quick’s Guilford County colleague, Rep. Pricey Harrison, also gave the Republicans no slack. Over on the Senate side, Democratic Minority Leader Dan Blue (D-Wake) is one of the five Democratic committee members, along with African-American colleague Sen. Floyd McKissick (D-Durham). But Blue doesn’t hold out much hope for a fair process. [WILMINGTON] A 58-year-old Leland woman has filed a class action lawsuit against Chemours, the chemical company that admittedly has been dumping the toxic chemical Gen X into the Cape Fear River, allegedly polluting the New Hanover County water supply, and it’s parent company, DuPont. Victoria Carey alleges in her suit filed Monday in federal court that in June she had sludge samples from her five-year-old water heater tested at a private lab. The results showed higher than normal toxicity levels for Gen X. Ms. Carey is suing Chemours and Dupont for negligence, among other charges. This is the third lawsuit against the companies since the new broke about Gen x contamination last June. [JEFFERSON] An Ashe County grand jury has indicted the sheriff there for three counts of felony obstruction, and a misdemeanor charge of willful failure to discharge his duties. Sheriff Terry Buchanan. A local TV station investigating Buchanan’s appointment to office last January found itself denied communications records between the sheriff and the Ashe Board of Commissioners twice. Then in April, Sheriff Buchanan, allegedly referencing the records denial, told the board, “We don’t have time for this.” Now the NC State Bureau of Investigation is looking into the matter. As the second place finisher in the October 10th Raleigh mayoral primary, the last thing candidate Charles Francis needs is a loss of support. But with two weeks before the Nov. 7th runoff, that’s what Francis faces as Equality NC Action Fund, a political action committee representing the LGBTQ community, tool back it’s endorsement of Francis because a closer look at his history reveals he once campaigned for an anti-gay rights Republican candidate for senator. Francis is a Democrat, and was endorsed by the Wake Democratic Party, even though the Raleigh mayoral race is nonpartisan. Francis is trying to unseat three-term Mayor Nancy McFarlane.